The previous article in this series outlined why Apple's change in accounting isn't an attempt to hide bad news; the company will still be reporting revenue, and Apple just provided guidance for a record-setting holiday season this quarter. On its November 1 conference call, Apple's chief financial officer Luca Maestri stated "we have the strongest lineup ever as we enter the holiday season and we expect revenue to be between $89 billion and $93 billion, a new all-time record." Even so, analysts and pundits have jumped on the change as a worrisome development. That, in itself, sheds some light on why Apple is moving to change how it reports its performance. But first, consider how Apple's financial reporting has previously evolved as the company has grown, and why. Over the last twenty years, Apple's business segment reporting of revenues depicted above as percentages of its total revenue and its parallel unit sales reporting have changed multiple times. Until 2004, Apple was primarily selling Macs, so the company, then known as "Apple Computer, Inc." reported both revenues and detailed net unit sales numbers for the four segments of its primary business: Power Macs (including servers) and PowerBooks aimed at professionals, and iMacs and iBooks marketed to individuals. The above visualization depicts segmented shares of Apple's total revenues for each year. The left edge of the chart is a breakdown of 1997's annual revenues that totaled $7 billion, the year where Apple actually lost over $1 billion. The right edge represents 2016's revenues of $215.6 billion: over 30 times larger. That year, Apple earned $45.7 billion in net income. So, while the visualization makes it look like Apple's Mac business shriveled away into nothing, in reality, it went from representing virtually all of Apple's revenues in 1997 to accounting for "only" 11 percent of its total revenues in 2016 —despite Mac revenues growing into a $22.8 billion business segment. A decade ago, Apple was volunteering an incredible level of sales detail in its financial reports. That didn't stop investors from panicking; instead it simply armed sensationalists with data to use against the company. This level of detail changed in 2005 when Apple began reporting Mac sales only in terms of desktops and portables. The company also added iPhone unit sales in 2007 and iPad unit sales in 2010. 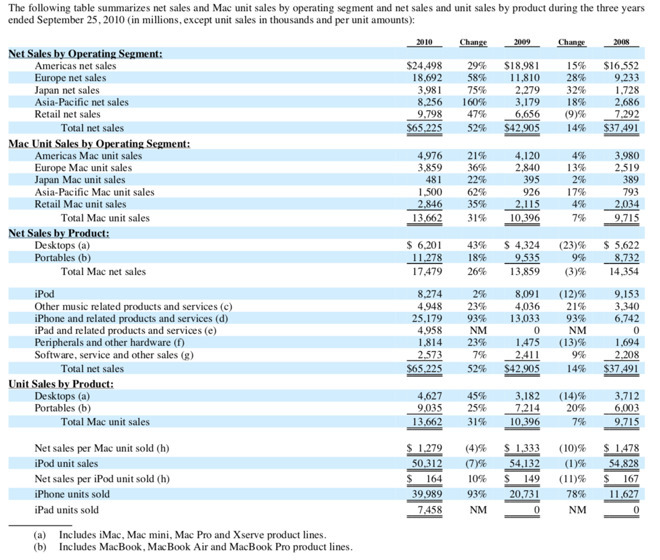 In 2011 it stopped detailing Mac unit sales by Operating Segment (region), and in 2013 it stopped detailing categories of Macs and only reported total Mac unit sales globally. Analysts and journalists have clearly benefitted from Apple's official reporting of unit sales. However, they have also often gotten hung up on a series of wrong conclusions they arrived at incorrectly (and periodically maliciously) as they attempted to use Apple's own unit figures against the company. One example of a wrong conclusion drawn from Apple's extremely detailed reporting of unit sales comes from Japan, which appeared to experience a 3 percent drop in net sales and a 14 percent drop in Mac unit sales in Fiscal 2004. However, this alarming takeaway failed to note that Apple had opened its first retail store outside of the U.S. in Japan in 2003. 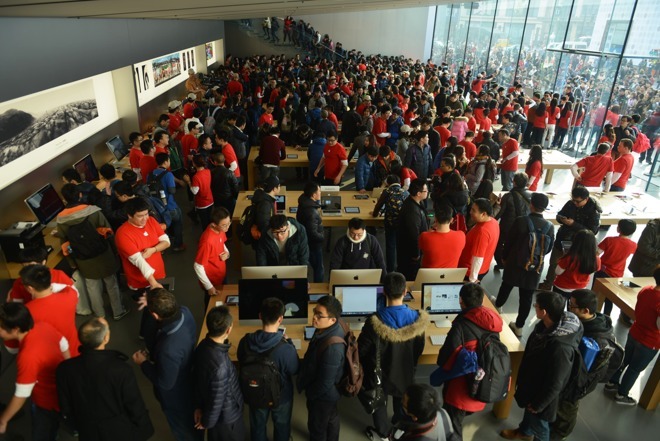 All of Apple's sales through its own retail stores were accounted as units and revenues of Retail, rather than being credited to a regional Operating Segment. So while revenue and units in Japan appeared to be falling, the reality was that they were growing. Apple was just selling an increasing volume of its Macs--and iPods--to the Japanese market via its own retail stores. Because its retail stores had originated in the U.S., its highly transparent accounting practices had created the illusion of a problem in Japan because people who didn't understand the increasing complexity of Apple's global operations made faulty, simplistic assumptions while skimming through Apple's financial reports looking for some alarming detail to sensationalize into a headline. Japan has long been an important market for Apple. Yet since the misunderstanding of retail growth there in 2004, the country has repeatedly been depicted as being a huge problem for Apple, particularly with regard to iPhones. Nobi Hayashi, a journalist in Japan, noted that a local paper, Sankei Shimbun, created the idea that Apple and its carrier partner Softbank were aiming to sell a million units there in its first year, but had only achieved sales of about 200,000. In reality, neither company ever announced such a goal, and actual iPhone sales were around double what the paper had reported. In 2008 Yukari Iwatani Kane of the Wall Street Journal invented the idea that iPhone had completely flopped in Japan due to high prices and consumer apathy (sound familiar? ), based entirely on "missed expectations" invented by a research firm and rumors of that million unit target. In 2009 Wired published "Why the Japanese hate the iPhone," an incendiary article crafted by blogger Brian X Chen. That completely false narrative included fake quotations attributed to a real person that included, "carrying around an iPhone in Japan could make you look pretty lame." Wired later admitted Chen's article had a variety of problems after his "source" stated that the quote was something he had never said and didn't agree with at all. Apple has never officially reported quarterly iPhone figures for Japan. However, as various "journalists" teamed up with "market reachers" to contrive fake stories about how much Japan hated the iPhone, how it wasn't innovative enough for the tech-savvy country, and how its price was far too high for anyone to afford, Apple was detailing its revenues from Japan in parallel with unit sales of Macs there (as depicted above in Apple's 10K from 2010). Between 2008 and 2010, Apple's Mac unit sales in Japan grew by 23 percent, but its total revenues grew by 130 percent. Pretty clearly, iPhone was massively contributing to huge growth in Japan. That public data provided by Apple didn't stop a series of claptrap articles from regurgitating false media narratives about Apple's sorry plight in the Land of the Rising Sun. 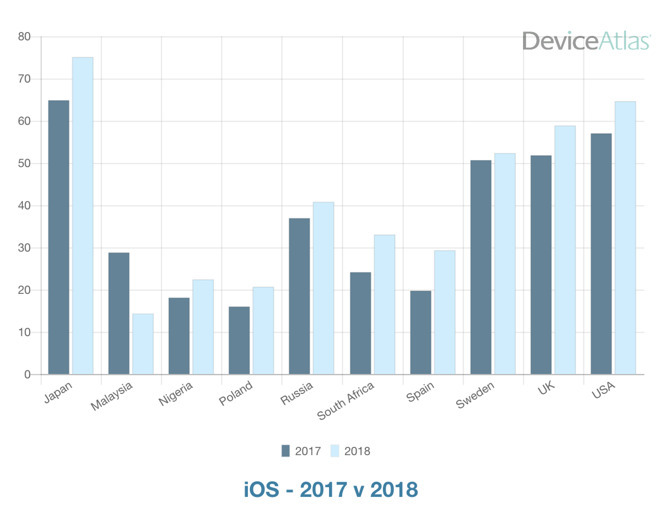 Today, Japan actually represents what appears to be the highest concentration of iOS use (vs. Android) by its installed base of mobile users--peaking this year at 75 percent, compared to 65 percent in the U.S., according to Device Atlas. Over the last fiscal year, Apple's revenues from Japan grew by 23 percent, higher than any other region Apple reports. That means its time for the Wall Street Journal to contrive a new story about how Japan hates Apple's latest product so much that the company must offer an incentive price discount (of $100, or 13 percent) to mobile operators to boost sales of its iPhone XR —something so routine for other phone makers that it isn't even news when they slash their prices into loss leader territory or offer "buy one get one free" promotions. No amount of detailed unit reporting could stop these writers from inventing narratives about how Japan hates Apple and everything it makes so much that its people spent $21.7 billion on Apple products and services over the last fiscal year. To help visualize how big that number is: that's about half of Facebook's total global revenues last year. When iPod unit numbers began exploding in 2003, a series of analysts and pundits decided that Apple should just abandon the Mac because the company was seeing triple-digit growth in its unit sales of music devices but no similar scale of growth in Macs —where total unit growth was reported to be only 9 percent in 2004. In 2005, prolific tech pundit of the early Millennium Rob Enderle imagined that Microsoft's new Xbox 360 "may even take out Apple, forcing the company to exit the PC business." "I know a large number of folks who expect Apple will take the first option ["exit the computer business and concentrate on the more powerful accessories market"] and get out of the PC business altogether in order to better focus on the new and highly profitable classes of multimedia products," added Enderle. "Most of the people who think this way are developers." That takeaway was idiotic, as expanded iPod sales were helping to drive Apple's retail efforts, which subsequently fueled long-term Mac growth and set the stage for launching iPhone and iPad. Even in 2005 as Enderle fantasized about the end of the Mac, Apple's PC sales were growing by 38 percent to reach 4.5 million units annually. By 2010 Apple was selling 13.6 million Macs annually. Eight years later, Apple is now selling 18.2 million Macs per year, despite also having created an entirely new computing platform with iPad, which sold an additional 43.5 million units across the same period. Apple's sales of 61.7 million iPads and Macs made it the largest computer maker across the last four quarters, ahead of both HP and Lenovo, which each sold around 57 million PCs in a shrinking market. 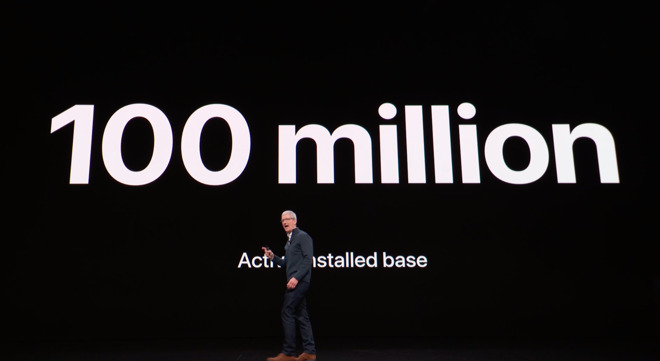 And while the installed base of Enderle's beloved Xbox (both the 360 and One) has hovered around 50 million units, Apple's active installed base of Mac users has reached 100 million. Yet fifteen years ago, without any long-term vision or any clear understanding of Apple's future plans, a number of pundits kept repeating the narrative that Apple was "no longer a computer company" and therefore needed to exclusively focus on iPod, despite clearly having no clue of what Apple was doing internally nor any real grasp of what was occurring in the industry. All they had were unit sales numbers of current iPods and Macs, and that didn't help them understand anything. As sales of smartphones that could play MP3s began to increase, many analysts and bloggers got in it their heads that Apple's iPod sales would subsequently collapse and Steve Jobs brief period of success would finally end. What really happened is that when Apple introduced its new iPhone in 2007, the nature of iPods largely converted into a software feature of iOS. Yet even before Apple announced the new iPhone, David Smith of The Guardian wrote the premature 2006 eulogy "Why the iPod is losing its cool," which claimed, "sales are declining at an unprecedented rate. Industry experts talk of a 'backlash' and of the iPod 'wilting away before our eyes'. Most disastrously, Apple's signature pocket device with white earphones may simply have become too common to be cool." While the annual number of physical iPods units Apple sold eventually did decrease, that didn't happen until 2009. Smith, along with the various experts who fed him soundbites portending doom for Apple because its reported iPod unit sales were flat for two quarters after 17 quarters of growth, were all obsessing over those unit sales without any understanding of what was going on inside of Apple. All they could see is a seasonal decline in iPods sold over the summer, so they wrote up apocalyptic death scenarios. Further, while iPod unit sales tapered off, the base of iPod users buying downloads from iTunes continued to expand dramatically mostly because all iPhones were also "widescreen iPods," something Steve Jobs articulated at the new phone's debut. Yet tech journalists and some analysts kept fixating on the unit numbers reported for standalone iPods and arrived at truly stupid, myopic conclusions. Rather than looking at the larger ecosystem for iTunes downloads and Apple's dramatic expansion of mobile device hardware revenue, many pundits grew infatuated with obsessing about iPod sales as if it were some kind of substantial "bad news" that was effectively erasing Apple's true gains. In reality, Apple was upgrading its iPod unit sales from low-priced MP3 devices to a more broadly powerful iOS product that attracted a premium price while leaving its users more satisfied, more loyal, and more likely to return for more Apple-branded hardware in the future. 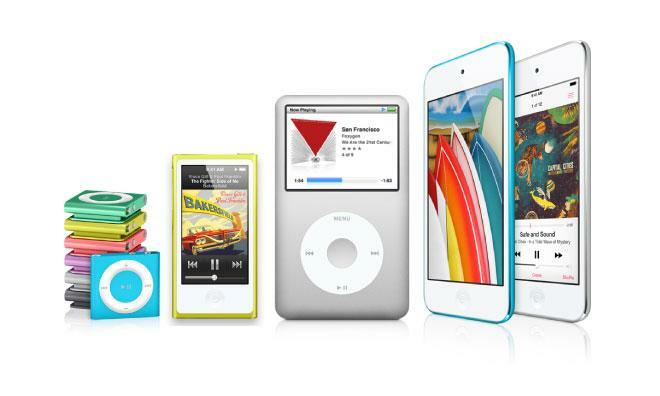 In 2008, Apple reached peak sales of 54.8 million iPods, at an average selling price of $167. That year it sold 11.6 million iPhones at a unit price of about $560 each. The next year, pundits obsessed over the one percent decline in iPod units sold, even as iPhone units grew by 78 percent and the revenue they generated grew even faster, by 93 percent. In part, both shifts were related to the fact that iPhones were also iPods, an obvious reality that pundits' facile analysis failed to grasp because they were looking for sensationalism rather than really understanding the trends that were occurring in Apple's business. Unit sales figures didn't help them understand what was going on, even as Apple spoon-fed them per-unit prices in parallel. Despite its shrinking unit sales, iPod retained a remarkable 72 percent share of the market for standalone music players even at the end of 2013, as NPD research analyst Benjamin Arnold reported at the time. However, many analysts and journalists failed to grasp how incredibly well Apple was orchestrating the market transition from iPod to iPhone because they were simply distracted by unit sales figures. It was as if an audience of judges were scornfully laughing at the triathlete in the lead because he was no longer making any documented progress in swimming when in reality he was now riding a bike far ahead of all the other contestants. The cyclical nature of Apple's iPhone business initially resulted in unit numbers dipping in the spring quarter after its launch. This was broadly interpreted in the most cynical way among Apple critics, who insisted that quarterly fluctuations in iPhone unit shipments were an ominous sign that iPhones were losing their appeal and that buyers were deserting Apple for alternatives. The same poor analysis erupted in regard to iPad unit sales following the tablets' mini-fueled peak in 2014. When Apple introduced new larger iPhones, a significant segment of the unit sales of smaller iPads starting at $399 effectively shifted upward in the form of large numbers of Apple's new $750 iPhone 6 Plus. Total numbers of iOS devices shot upward, even if Apple's detailed unit reporting made it seem noteworthy that mobile devices branded as iPad were "collapsing," at least among writers who didn't have a very good grasp of what was happening in the industry. Critics continued to pick at iPad sales for years. Some essentially announced that tablets were over and done, even as Apple continued to ship the most tablets—multiple millions per quarter—and earn nearly all the profits in the global tablet market. iPad continues to remain roughly tied with Apple's Macs in generating around $18-20 billion dollars in revenue every year, yet simplistic quick takes based only on unit sales numbers have fueled misinformation and misleading media narratives. This fifth example is a variation of the "Apple is now the iPod company" nonsense of the early 2000s. A decade later, Apple's unit sales of Macs were being dramatically overshadowed by a new product: iPads. Near the peak of iPad unit sales in 2015, Christopher Mims published his blistering hot take for the Wall Street Journal that opined that Apple should "kill off the Mac" and "focus on products which represent the future," in part because Macs were generating less than 10 percent of Apple's total revenues and "Apple doesn't need this revenue." That year, Apple sold 20.6 million Macs generating $25.5 billion in revenues and 54.9 million iPads generating $23.2 billion. Over the same period, Microsoft's Surface division generated about $3.4 billion in revenue, but no major financial newspaper thinkers were recommending that Microsoft "give up" because mouse-based PCs represented the past, that hardware experiments were distracting its focus, or that Microsoft didn't "need the revenue" because Surface contributed very little to its total revenues —and were a fraction of Apple's Mac revenues. Since then, there has been a flurry of pundit advice recommending that Apple slash its prices. Instead, Apple has effectively made Macs its luxury computing tier, resulting in sales of 18.2 million Macs in fiscal 2018 while still generating revenues of $25.5 billion. And while sales of iPads have slowed due to a number of reasons to their current figure of 43.5 million units annually, revenues there still generated $18.8 billion this year. If Apple had taken the advice offered by the Wall Street Journal in 2015, it would have given up sales of about 56 million Macs and revenue of $74.2 billion, just to "focus" on mobile iOS devices targeting two markets that are shrinking globally: smartphones and tablets. To visualize that large number, it is nearly 15 times what Rupert Murdoch spent to acquire the Wall Street Journal. When the Wall Street Journal pretends to be able to interpret rumors about Apple's global supply chain today, remember the depths of its incredibly ignorant advice it offered up as a serious thought-piece just three years ago, and how wrong it has been ever since, serving up buckets of false commentary under the guise of being a credible financial newspaper. Writing for the Wall Street Journal earlier this month, Tripp Mickle addressed Apple's announcement that it would stop reporting unit sales for iPhone, iPad, and Macs by writing, "When Steve Jobs took a swipe at Amazon.com Inc.'s Kindle in 2009, he pointed to the online retailer's decision not to report unit sales of its reading device as evidence it wasn't selling many. Nearly a decade later, Apple is following a similar path." One bit of logic that escaped Mickle's cynical skewering: no columnist or pundit ever scrutinized the sales of Amazon's Kindle the way Apple's unit sales have been sliced, diced and contorted into steaming piles of bad news over the last two decades. Instead, Kindle has always been assumed to be some sort of reasonably successful venture, despite the fact that Amazon has never released either unit figures or even revenues related to its e-reader business. And despite Amazon's attempts to portray Kindle as the "iPod of books," it never even briefly achieved anything on the order of Apple's success with iPods, while also failing to ever morph into some other kind of success the way iPods birthed Apple's iPhone and Apple Watch lines. Kindle e-readers spawned the Fire Phone disaster and a line of Fire tablets that have not only never officially reported sales figures nor revenues but have only ever been offered at fire-sale prices. On top of that, the Amazon App Store never turned into a commercially significant business anywhere comparable to Apple's own globally leading App Store. More recently, Amazon's Alexa products have been gushed over with the kind of fervent adoration usually reserved for Google's hardware. Yet neither company has ever provided quarterly figures for units sold or revenues generated. And, its only been in retrospect that we've found out that both were incredible flops that not only failed to generate hardware revenues or sell in meaningful quantities, but also failed to drive their limited set of users to Amazon's shopping or Google's various advertising services with any commercial significance. Additionally, Mickle's jab at Apple's unit reporting change also failed to grasp that Apple is still going to report revenues from its hardware and services business units, so it won't be hiding any collapse in sales. It will just be feeding journalists less ammunition to use in shooting themselves in the foot as they attempt to take wild potshots at Apple. Nothing captures the wholesale contempt for accuracy in tech industry reporting quite like pundits' takes on historical iPad unit numbers. 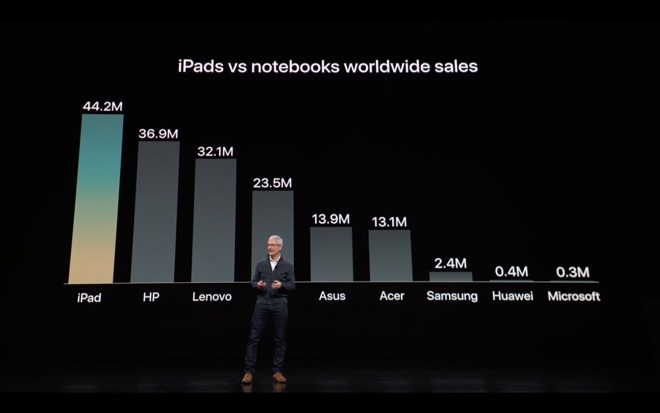 These were used to claim for years that Apple's iPad business was collapsing at death's door even as they were actually generating tens of billions in profits on sales of millions of iPads to both individuals and the enterprise every quarter for years. IDC recently admitted that iPad was indeed leading global tablets "unabated" after eight years of denialism that sought to portray flops like Tablet PCs and Windows Phone as long-term winners. Note that neither Microsoft nor its licensees have ever issued quarterly unit figures of their sales of phones or tablets. And at the same time, assumptions were bandied about how great the future of Google's tablets was looking despite the fact that Google failed to ever create a successful tablet business. As Google gave up on tablets and began dumping Chromebooks on K12 education, the narrative shifted to how devastating this was for Apple, despite the fact that iPads sell across important markets globally in vastly greater quantities, while Chromebooks have never grown popular in any real market outside of the few million loss leader units provided to K12. So while it's nice to have Apple report unit sales of its product categories, the reality is that these numbers have historically been used against the company to promote outright lies and incompetent analysis, while also giving Apple's competitors a valuable flow of free market data on the most successful hardware maker in the industry, data that rivals don't reciprocate. Just prior to the launch of Apple Watch, Apple announced it would stop reporting unit sales of iPod and wouldn't release unit number for Apple Watch. This generated handwringing among members of the media and various analysts, who were especially worried that they wouldn't have any way to gauge how successful Apple Watch was. Many jumped to the conclusion that Apple didn't have high hopes for its new wearable, nor very good prospects for entering the smartwatch business—which already had a series of established vendors, including Samsung, Fitbit, Pebble and a series of Google's Android Wear partners, including at the time Google's own Motorola subsidiary charged with promoting wearable Androids. Of course, none of these vendors ever published quarterly unit sales of their smartwatches. 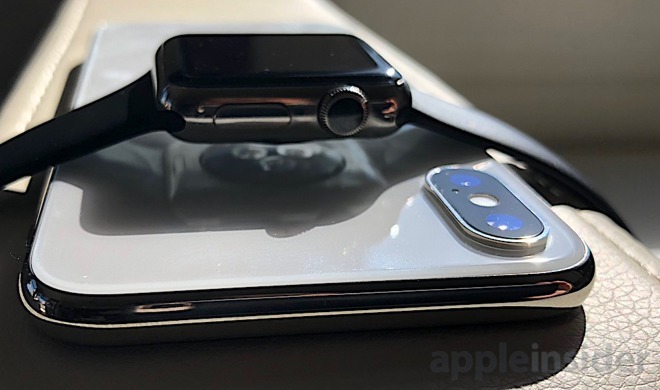 Early data suggested that Apple wasn't selling enough watches, or was getting beaten in the market by lower-priced devices, based solely on estimates of unit shipments. But again, the reality was that Apple had created a premium product that was effectively attracting an enthusiastic audience. Within just a couple years, Apple Watch had destroyed all apparent potential for alternative smartwatches and had even begun to devastate the larger market for luxury watches. Rather than "hiding" its unit sales, Apple focused on detailing revenue trends related to its Other Hardware as a group, and regularly noted in particular the health and growth of its wearables specifically. Beyond Apple Watch, Apple has also never released quarterly unit figures for AirPods. That had no impact on AirPods being wildly successful but did prevent competitors from gaining access to very valuable data on where Apple was investing its innovation capital. At the same time, media chatter about the fall of iPods largely diminished because there were no longer any official unit numbers for pundits to obsess over and ignorantly blow up into a fake problem. As I've noted before, not only have all iOS devices effectively become "iPods" in both utility and as an installed base driving the sales of media downloads and now Apple Music subscriptions, but Apple Watch itself is essentially Apple's modern iPod, upgraded in its capabilities and style, and able to demand a much higher price. Apple clearly isn't hiding its internal unit sales of wearable units out of shame, but rather because that data was both unnecessary to make public in front of its competitors and because reporting unit figures would most likely be interpreted with the same sort of incompetence and malicious cynicism on display across the last two decades of its unit reporting of Macs, iPods, iPhone, and iPad. Apple's Fiscal Q1 2019, which started October 1, will mark the first time the company won't report unit sales of Macs, iPods, iPhone, and iPad, just as with its Other Hardware. Beyond avoiding sharing this data with rivals and taking unit sales out of the view of critics seeking to use it against the company, Apple's executives have outlined other key reasons for not focusing on unit sales. In its most recent conference call with analysts, Apple's chief financial officer Luca Maestri noted that "the number of units sold in any 90-day period is not necessarily representative of the underlying strength of our business." In other words, rather than "hiding the number of units sold," Apple's real intent is to avoid hiding meaningful insight behind a simple total of units sold. Maestri separately clarified this by stating "to give you an example, the unit sales of iPhone at the top end of the line have been very strong during the September quarter, and that's very important because we're attracting customers to the most recent technologies and features and innovation that we bring into the lineup, but you don't necessarily see that in the [iPhone units sold] number that is reported." Rather than unit sales providing clear insight into Apple's business, they are often a distraction from more important data on the nature of Apple's business. Historically, this was true when iPod unit sales grew vastly larger than Macs; when iPods began shrinking; when iPhones dipped seasonally; when iPad units converted into iPhone sales; when iPad unit sales eclipsed Macs; and as Apple has sold more advanced, higher-end models rather than just volumes of basic or cheaper devices. Maestri added, "a unit of sale is less relevant for us today than it was in the past, given the breadth of our portfolio and the wider sales price dispersion within any given product line." Again, Maestri is effectively noting that unit sales are not all equal. The sale of one ultra-premium iPhone is worth more than the "two units" represented by a low-end iPhone and a separate iPad mini. Defining its business in terms of unit sales obscures one of Apple's most valuable core competencies: the ability to attract and retain loyal buyers who continue to buy premium new Apple gear and make use of subscriptions, services, accessories, software and other content, both on a scale unmatched by competitors specializing in "unit sales," with a primary goal of gaining volume "market share" rather than building a customer base as Apple has. Maestri also separately stated, "the number of units sold during any quarter has not been necessarily representative of the underlying strength of our business. If you look at our revenue, given the last three years, if you look at our net income during the last three years, if you look at our stock price here in the last three years, there's no correlation to the units sold in any given period." He also noted that "our top competitors in smartphones, in tablets, in computers do not provide quarterly unit sales information either." "The second thing is a little bit like if you go to the market and you push your cart up to the cashier and she says, or he says, 'how many units you have in there?' It doesn't matter a lot how many units there are in there in terms of the overall value of what's in the cart." Apple isn't focused on volumes of units sold, but rather volumes of customers who are "sold" on Apple. A followup article will detail the reasons why, and how this changes the products Apple develops, how it differentiates them from competitors, and why it is key to understanding Apple and its future as a global brand.